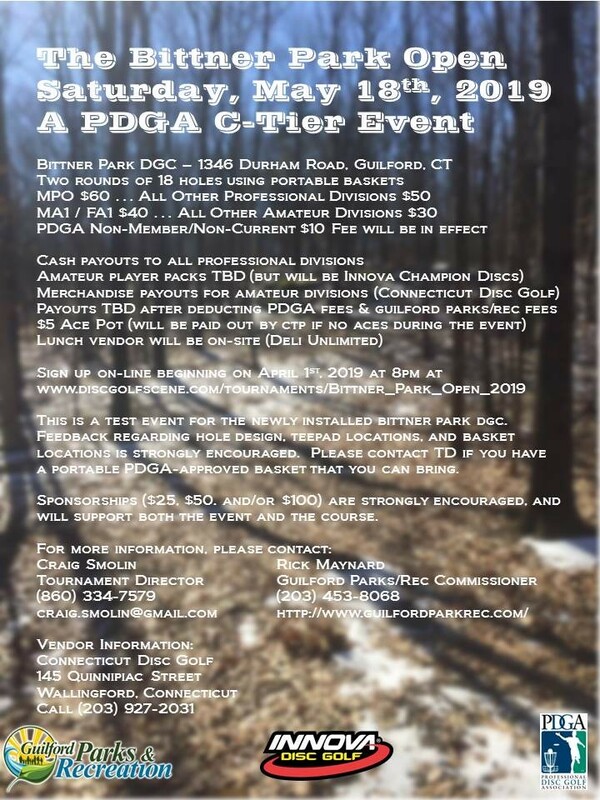 The Town of Guilford presents the first tournament at Bittner Park DGC. Bittner Park is a brand new course that is currently in the last phase of construction of an initial "short to short" layout. This event is intended to be a "soft opening" to gather player feedback on course design as well as to collect statistical data to modify each individual hole. The tournament will be played using temporary/portable baskets and natural teeboxes. Following the event and any course modifications, Innova DisCatcher 28s will be installed along with permanent tee pads (likely to be artificial turf). Future course work will likely include the installation of long tees and long baskets on every hole. At the end of off-ramp, turn left, proceed under I-95 and continue north on Route 77 for 3.5 miles. Park entrance will be on your right hand side. From I-95S: take Exit 58, and turn right off of exit ramp. Continue north to park entrance. Bittner Park will be approximately 1.5 miles south of the intersection of Route 77 and Route 80. Sponsorships are available at the hole ($25), program ($50), and event ($100) levels. Bittner Park is a drug-free and alcohol-free Town of Guilford Parks & Recreation facility. The use of drugs and/or alcohol at any time in the park will results in a disqualification from the tournament. No exceptions will be granted. Additionally, please note that there is a $300 Town of Guilford usage fee that will be incurred. This cost will be spread out amongst all players at the TD's discretion. Town of Guilford Parks & Recreation Department is responsible for all refunds/cancelations. Awards to immediately follow Round 2 after scoring is completed.